There are many situations in a DBA’s life that lead him or her to monitor space growth over time in SQL Server. In short, we often want to know which tables are growing the most and how much they grow. In following, we will first define to which extent we can go in table size monitoring and discuss some situations that should be part of the solution we want to build. Then, we will design the table that will host collected data and could be used in all the situations this solution is built for. We’ll also define a table that will contain the list of objects that the solution has to monitor. This will change the object size monitoring task to a simple INSERT statement in that table. Once those two tables are created, we will then consider the stored procedure that we will use to actually collect desired data and create a SQL Server Agent Job to automate the call to that procedure. We are interested in monitoring database object size, not database size itself. In order to do that, we should first list out which database objects can actually take space in our database’s datafiles. The first object type that everybody has in mind is the table object as a table contains data and data takes space no matter the way it’s logically structured: as a heap or as a clustered index. We could get back space information by building a query using sys.allocation_units system view. But that’s not all, as a table can be partitioned. A table is partitioned based on a key criterium that makes SQL Server put the row in one table partition instead of another. In many situations, this key criterium is date-based so that some partition keeps a static size while one particular partition becomes larger. If you are not used to table partitioning, we invite you to read SQL Server’s documentation about the subject. We won’t implement size monitoring for this kind of allocation unit, but let the door open for future developments. Moreover, both table and table partitions are created using an enumeration of columns, each set of these columns is referred to as a record or a row. These columns are defined with a given data type (INT, BOOLEAN, VARCHAR (256), TEXT…). While some of these data types have fixed size, like INT or BOOLEAN, there are other data types that takes more or less space in the database based on its contents. For instance, it’s the case for VARCHAR data type. Based on this consideration, we could want to monitor space consumption for a particular column. This is totally achievable using SQL Server’s DATALENGTH built-in function, which returns the number of bytes used to represent any expression. Furthermore, there is another kind of object that take space and is related to tables. It’s a table index and its extension: the partitioned table index. Both contain a subset of each records that are stored in a particular table. They could be considered too in our solution as they can be seen as an extension of a given table and the more indexes are built for a particular table, bigger is the actual amount of space consumed for that table. Nevertheless, we won’t cover this case in this article, but let the door open for further development in that way. We won’t consider at all database and filegroup space consumption monitoring. We’ll allow user the capability to filter the rows that should be considered to compute statistics. In that case, for a fixed size data type, the most useful information should be the number of rows. This could be useful, for instance, when a table has a status column that takes different values and we would want to monitor how many items are in the “in wait” status over time. Recording the size of an object just once is not really useful. Regularly taking snapshots as part of collection process is our goal. But, we won’t stay behind our computer and run it by ourselves, even at midnight on Sunday. We need to automate this collection and that’s where SQL Server Agent becomes very handy. We can define and schedule a SQL Server Agent Job to regularly do the task for us. But, based on the object(s) we want to monitor, we might be willing to pick their space consumption once an hour while, for another one, this collection could be done once a day. A solution could be to run the same job every time and only take data of interest for the collection that occurs once in a day, but this would lead to waste of space and server resources consumption (23/24 records took in a day should just go to the trash). This will also bring another plus-value to the solution: the capability to dynamically start a new collection, change the collection recurrence settings or simply stop the collection with simple INSERT, UPDATE, DELETE queries. In the case we would want to have a central server from which we would fire the task and to which we would store results, our solution must have a reference to the name of the server instance from which data is extracted. The same goes for the parameter table discussed above. Every object that is specific to this solution will be stored in that schema. Now, let’s talk about the table that will store collection results. We will call this table [SpaceSnap].[ObjectSpaceHist]. This table needs to keep track of the moment at which data has been inserted. For that reason, we will define a column called SnapDate of DATETIME2 data type. You could read in my article SQL Server DateTime data type considerations and limitations and understand why it’s preferable to use DATETIME2 data type instead of DATETIME. UsedSizeMb will store the actual size used by the object. The ratio between this column and TotalSizeMb could help in the investigation of a data fragmentation. Finally, we need to refer to ensure uniqueness of each record. To do so, we’ll add a column called ObjectUniqueId that is computed based on object information listed above. To keep space consumption as small as possible, this value will use HASHBYTES built-in function and SHA-1 algorithm. The script to create this table is called « Table.SpaceSnap.ObjectSpaceHist.sql » and can be found at the end of this article. Now, let’s talk a little bit about the table which will contain the list of objects we want to monitor. We will call it [SpaceSnap].[MonitoredObjects]. We will design this table so that it can be used by other collection processes related to space monitoring by just adding a BIT column telling the process to whether consider this object or not and maybe process dependent columns. This solution will follow the same principle and MonitoredObjects table will be created with a SnapSpace Boolean column. This table will obviously use same column names as [SpaceSnap]. [ObjectSpaceHist] table for representing the information about the object we want to monitor. It will also use the HASHBYTES built-in function to uniquely identify a record in that table and build an index on this. SnapIntervalUnit and SnapIntrvalValue – will tell that it should consider this object with SnapIntrvalValue amount of SnapIntervalUnit. For instance, 5 would be a candidate for SnapIntrvalValue and ‘HOUR’ for SnapIntervalUnit. We could eventually add two columns for fast check of aggregate values on how much data space and how many rows are created in a simple day on average. These columns would bear following names respectively AvgDailySpaceMb and AvgDailyRowsCount. Full creation script is can be found in the Downloads section of this article. It is called Table.SpaceSnap.MonitoredObjects. Now that the foundations have been laid, it’s time to build our collection process. This will be materialized by the creation of a stored procedure. This procedure will be called [SpaceSnap]. [CaptureObjectUsage] and will do the job, no matter the situation that needs to be handled. For testing purpose (and maybe also for further developments to a centralized collection solution), we will let user the capability to get back collection results instead of let these results go to a table. This will be done using a boolean parameter called @ReturnCollectionResults. In this mode, we will collect space consumption information for all tables in the given schema of specified database (Parameters @DatabaseName and @ObjectSchemaName). In this mode, use all specified information about a particular object for which this stored procedure should collect details. In this mode, only records from parameter table will be used. As this mode is especially designed for automation, the @ReturnCollectionResults parameter won’t be considered and a destination table is mandatory. This mode will recursively call [SpaceSnap]. [CaptureObjectUsage] stored procedure. For that reason, we will also define a @_RecLevel to tell stored procedure the depth of recursivity in which we are and in case of debugging, display messages with padding. Furthermore, we could be willing to run our procedure multiple times but keep the same collection time in order to reference the results of a batch (instead of a procedure run). For that reason, we’ll use a parameter called @_CollectionTime. Finally, there is a @Debug parameter that, when sets to 1, is used to tell the stored procedure to be more talkative during its execution. Here is recap table that maps collection modes and object-related parameters. Yes means the parameter is considered. No means it’s not considered. An underlined Yes means it’s considered as mandatory. The interesting steps of this procedure are “Object List Selection” and “Object Space Consumption Collection”, so we will focus on them. There is a distinction to make between PARAMETERIZED collection mode and the others: the former will read from a table and call [SpaceSnap]. [CaptureObjectSpaceUsage] as many times as there are rows in parameters table that need a collection to occur while the latter will only focus on the actual collection. Create a temporary table that will generate necessary commands for calling [SpaceSnap]. [CaptureObjectSpaceUsage], telling this procedure that it’s a recursive call. Insert the list of objects that need a collection into a temporary table so as the T-SQL statement to run our procedure recursively. Call generated [SpaceSnap]. [CaptureObjectSpaceUsage] using sp_executesql. If successful, update parameters table so that we won’t consider these objects in another run if they do not have to be considered. the difference between the value of this column and current time (based on the SnapInterValUnit column value) is above 95% of the value for SnapIntrValValue column. This 95% is empirical and could be different. 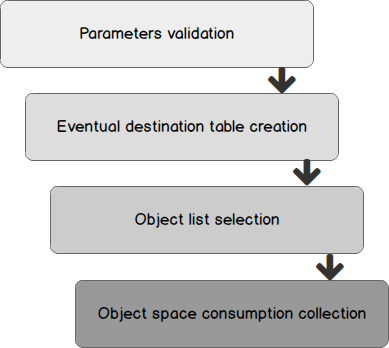 Actually, when collecting space consumption for table or table partition in another mode than PARAMETERIZED, these two steps are performed at the same time, in a single T-SQL query based on procedure’s parameters. In order to take advantage on SQL Server set-based processing capabilities, which makes collection run faster and less resources-consuming than if it were running in a procedural approach, and dynamic SQL. Because all the objects that are considered are all in the same database. For that reason, we can only consider existing objects on the fly. Equality on object identifier – OBJECT collection mode for tables. Run a query against the table or partition using COUNT_BIG built-in function in order to set RowsCount column. Eventually, these two statistics computations will use the value of @RowFilter parameter. We will simply create a SQL Server Agent called “[Monitoring] Capture Object Space (PARAMETERIZED mode)”. Here is the creation script for such a SQL Agent Job. There is just one thing to change: the database name in which it should run. (Look for “CHANGEME”). Every object created here will be put into a database schema called [Testing]. Here is a T-SQL statement that will create this schema. Running this query will show you the row corresponding to this first execution of the stored procedure. Keeping our Testing.TableToMonitor table, we will use following call to monitor size of VarcharMaxCol column. For this step, we could let the SQL Server Agent Job we defined above run and do its job. But we recommend to disable it in order to get accurate results. If we look closely at the LogMsg contents, we’ll see that we did not set parameters appropriately. In fact, it’s not COLUMN, but TABLE COLUMN we should have used. This test leads us to add a check constraint to the MonitoredObjects table so that the INSERT statement will fail. If we run once again the stored procedure and it succeeds, then no results set is returned. If we wait for 10 minutes, then we’ll get a new record corresponding to size collection for TableToMonitor table but no record will be found for the VarcharMaxCol column as it’s parameterized for an hourly collection. Let’s generate some fake data to the table so that we can build a query that will report object growth for table objects only. This object growth could be expressed either in percent or in megabytes. The set of tables to be monitored with initialization data (its initial number of rows, its initial total and used size and an eventually used parameter for table growth). We will create 4 tables called Table1, Table2, Table3 and Table4. User should define the starting date from which compute these statistics using a @SinceDate parameter.